Tom Mustaine submitted four maps to id’s Master Levels for Doom II. id released three of them in one form or another, while the fourth languished in obscurity for quite some time. Mustaine eventually saw fit to release it on his blog as a historical footnote. TWM01.WAD wasn’t necessarily rejected for being a subpar map; rather, it was rejected for being essentially a rewrite of "The Inmost Dens", after which McGee told Mustaine to "go make some of [his] own geometry!" While on vacation I've researched CSS and used it to clean up some of the indices, mainly the sortable index (shrinking down the text and using highlights for Cacowards instead of bolding/underlining the filename) and shrinking down the text for the author index. As indicated by the itinerary, I'm up to date through Jim Flynn's solo works. I played through I, Anubis, only to find out that Osiris is literally I, Anubis expanded, rendering my written review obsolete, but it gives me another talking point. After I finish Osiris and replay Chosen (should be pretty fast) I'll move on to Sverre Kvernmo's stuff and then Hell Month. Well, more like two months of Hell, or that's what it will be if I follow the update schedule. I'm hoping my buffer will hold out for when I slow down on 1997. Christen David Klie designated BF_THUD! "ChrisK for Doom ][". It is an evolution of CHRISK.WAD, which replaced one and a half episodes of the original Doom, which itself was an evolution of CHRIS_E1.WAD, which only replaced episode 1. 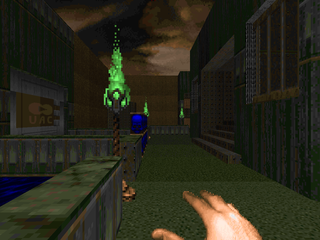 All of CHRISK.WAD can be found in the commercial Lost Episodes of Doom, with the addition of one level (E2M5). When Klie made BF_THUD!, he actually welded together three installments of his THUD series. 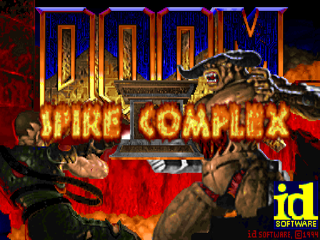 The end product drafted seven of his previous Doom works, made some minor (and major) adjustments in thing placement, and then rolled in 22 levels to put alongside them as his Doom II magnum opus. While some Doom II monsters make an appearance, Klie tends to stick with the tried and true three varieties of zombimen mixed in with some imps. Here it is, the last of Klie's twelve submissions to id's Master Levels for Doom II. 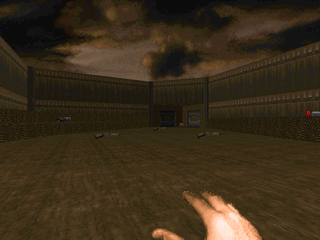 And, in retrospect, the Master Level project represents Klie's final work for Doom II. While the BF_THUD! review is forthcoming, it's really more a compilation of a series of three WADs he released in 1994 (entitled THUD*, subtitled CHRISK.WAD for DOOM ][). While this isn't the last WAD of his I'll review, it's a fitting conclusion to his Master Levels submissions. The Hive is a large map divided into two sections. The inner circle is a frenzied free-for-all which gives way to a quick key hunt. The outer circle is an obstacle course that more or less directly to the map's finale. Coming in at number eleven, here's Chris Klie's The Fury. One of the Master Levels outtakes, it's got beautiful, tropical scenery, highs, lows, and betrayed expectations. 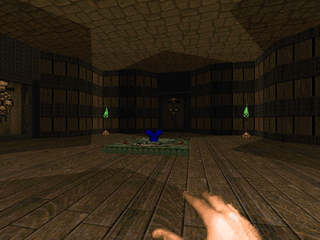 Voted the number one romantic comedy of 1995 by Hissy and Ebert, Hissy praised its honest portrayal of Doom II's combat and its use of earthen tones to establish its theme while Ebert criticized it for its symmetry, remarking that the map felt somewhat predictable after the first half. He did note, however, that veteran producer Klie managed to tie both parts together for an effective ending. Chris Klie noted that, of the twelve maps he submitted to id for their Master Levels for Doom II project, only two were rejected for quality concerns, Device One and The Enemy Inside (the rest due to time constraints and the 20 map ceiling). Neither are my least favorite Master Level offerings, but I'm just one person of several billion. The name of the map conjures up narrative questions. Where is the enemy inside of? Is Doomguy clearing out demons from underneath a base with a previously unknown secret? Or merely infiltrating an already-inhabited fortress of Hell? Either way, The Enemy Inside is a short level that takes place entirely indoors, featuring a heavy wood theme, with ample brown metal struts. Chris "Mapslinger" Klie made a bevy of levels in his short Doom mapping career. Counting the unique maps between CHRISK, BF_THUD! and his submissions to id's Master Levels for Doom II, he cranked out 47 scenarios for the average Doomer to enjoy. The D.M.Z. was one of the submissions to the Master Levels, but it didn't make the cut, so Klie released it as freeware for non-paying customers. There's no actual story, just a somewhat city-ish map; a circular, walled-in area with eight structures and scant few monsters. While six of Chris Klie's Master Levels submissions made it, six did not. Klie was gracious enough to upload the rejects to Compuserve (initially) and then the idgames archive (much later). If you haven't figured it out already, Device One is one of the outtakes. There's no actual story. I'm supposing that Device One is the strange machinery found at the tail end of the level, which is constructed in a darker techbase theme, more like OG Doom's "Toxin Refinery". Chris Klie worked so hard he got pneumonia getting maps ready for id's Master Levels for Doom II. It's a shame, because half of the submitted maps weren't accepted for one reason or another (perhaps the biggest factor being their arbitrary 20 map cutoff). Ever the mapslinger, Klie saw fit to release the six rejects to Compuserve (and then, after a thread on Doomworld got his attention, to the idgames archive!). As you might guess, The C.P.U. is one of the Compuserve releases. According to a post by the man himself on the Doomworld forums, Chris Klie's Subspace and Subterra were more or less two parts of a small series, with Subspace coming first and Subterra second. 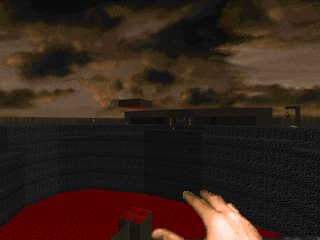 Both, of course, are maps from id's Master Levels for Doom II, and would have been joined by a third map, Subderma. Sadly, we have only the first two parts, the full trilogy itself less likely to materialize than Mordeth. As indicated by its name, the vast majority of Subterra takes place underground. The end result is a network of very brown caverns and tunnels. Most of Christen David Klie's submissions to id's Master Levels for Doom II use a pretty simple naming scheme, "The XXXX". Subspace is one of the few maps that breaks this trend. I'd like to think I know what you're saying right now. "Wow, this guy must be stretching to come up with different ways to start informative reviews for six levels with the same backstories." You're right! I am! And Klie made six more maps for the Master Levels that didn't even make it into the project! Whatever, dude / dudette. Subspace is in a techbase/outdoors style, mashing the two together, which creates alternating themes that help break up the scenery into more digestible pieces. Of the 20 (21) maps present in id's Master Levels for Doom II, Christen David Klie submitted six, outnumbering any other contributor. 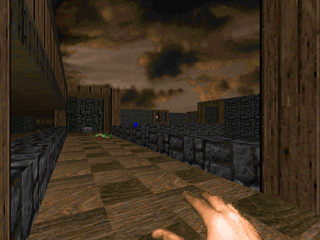 Indeed, if one considers all of the Doom and Doom II maps created by each Master Levels author, Klie has been the most prolific of them all, with authors Jim Flynn and Tom Mustaine considerably far behind. Part of this is due to Klie's mapping style which favors smaller, less architecturally complex maps. The Garrison is one of his contracted works. It's more of a castle-themed level, using wood, stone and featuring lots of nukage and water in the lower portions. This article serves as an index for my reviews of the Master Levels for Doom II as well as a brief overview of the relevant material as is my wont. Those wanting a far more thorough documentation of the Master Levels can find it here, containing interviews, walkthroughs, and other technical stuff. I'll try to hit the important notes. At least, I'll try to hit the notes that are important to me. 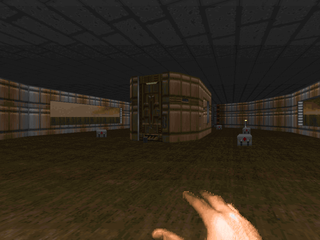 Of all the contributors to id's Master Levels for Doom II, Christen David Klie's are the most numerous, just barely edging out John "Dr. Sleep" Anderson and Sverre "Cranium" Kvernmo at a total of six. Like most of Klie's work, they're small levels, creating miniature adventures as opposed to large, performance-demanding landscapes. The Fistula is one of Klie's most constricting creations, only letting up on its claustrophobic sensibilities at the map's very end. It has a techbase texturing theme but its layout is fairly nonsensical, more like one of his earlier works. Christen David Klie had the good fortune to work on Blood as a contract designer with John "Dr. Sleep" Anderson early on in the project's history. When id contacted Anderson to contribute to their Master Levels for Doom II product, he made Klie aware of the situation, and I'm assuming Klie got in touch with id. While Klie made a grand total of twelve maps for inclusion, only six were accepted, The Combine numbering among them. It's a small, compact techbase-style level that show a marked improvement in mapping quality compared to Klie's earlier levels, showcased in CHRIS_K.WAD. 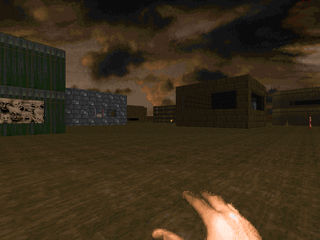 Christen David Klie submitted twelve maps to be used in id's Master Levels for Doom II project. Six of these were accepted; the other six were released by Klie to Compuserve (and then later to the idgames archives). The Catwalk is one of the maps exclusive to the released product. It has no included story, but Klie never had any pretense of forming a barebones narrative beyond what's presented in the work. It's a small techbase-style level featuring a fairly symmetric layout, but it's a bit more nuanced than simple mirror images. The key feature of the map is, as the title implies, the eponymous catwalk, which spans a massive pit that dominates the center of the level. Spire Complex is a nine-map replacement for Doom II by Callum Guy Oliver, aka Doomworld forum superstar phobosdeimos1. The .TXT asserts that the port is designed to work with any that supports extended DeHackEd patches. In reality, it's compatible with any Boom-compatible port, with one (somewhat major) caveat, but I'll get to that. It doesn't have much of a story, but from the sole intermission text, one can gather that the Spire Complex was breached by two demonic portals which the marine has been sent to shut down. Structurally, this divides the episode in to two sections. In MAP01-06, the marine fights his way through the base to shut down the first portal, battling its guardian, a powerful arachnotron. In MAP07-09, he is sent back in order to shut down the remaining gate. 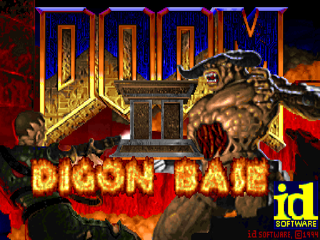 Part two of Callum Guy Oliver's "Raw Action" series, Digon Base is a five map minisode for Doom II, designed for ZDoom. 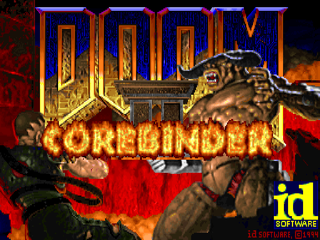 Like Oliver's Corebinder, the mapset features good ol' fashioned Doom II gameplay with sparing use of most of its monsters. Similarly, there's no given story, though the naming of the maps themselves suggest Doomguy's passage through various "provinces" before arriving at a gate. Are these sections of the eponymous Digon Base? Perhaps he's crashing a number of Hell-held outposts on the way to the base, his ultimate destination. Really, it's just speculation on my part. Let's get down to facts. Corebinder's subtitle is "Raw Action", and Callum Guy Oliver aka Doomworld forum superstar phobosdeimos1 delivers. This 4-map minisode for Doom II features some well-crafted map flow and gameplay. The biggest criticisms leveled at it are its lack of detail and substandard texturing. 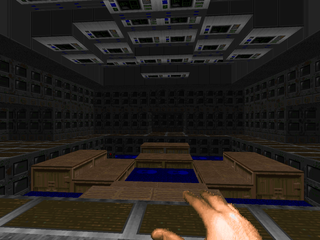 There are some misalignments, and Oliver uses the DOORTRAK texture in places I'm not used to seeing it, but Doom II's core gameplay remains, tightly packed into four small-to-medium-size maps. Granted, because of some goofs, it's a ZDoom-only WAD, but you aren't allergic to ZDoom, are you? Michael Jan Krizik (aka Doomworld forum superstar valkiriforce) made a bunch of Boom maps during 2010. 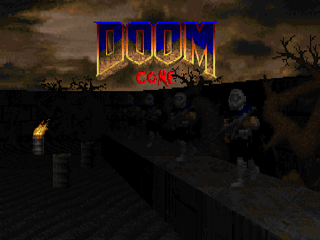 He polished the results, stripped them down to vanilla, mixed in some rejects from other projects, and combined them into a megaWAD called Doom Core. Krizik makes no effort to hide his influences; he's a child of '95-'96 mapping sensibilities, drawing from such authors as Chris Klie and Jim Flynn. He claims it's done in the Doom II mapping style, and while that may be true in terms of gameplay, aesthetically it's in a bit of a different boat. It's also heartening that, while people were playtesting Doom Core, he continued to push out quality work. Reverie, a WAD explicitly patterned after '96-era community WADs, enjoyed a 2011 release as well. In this way, he also appears to channel that unrestrained enthusiasm present in '96-'97 mappers.